Vanderbilt University’s contributions to the field of diabetes — past and present — were celebrated recently during the annual Diabetes Day at the Vanderbilt Student Life Center. Amidst the accolades was recognition that diabetes continues to take an enormous human and economic toll, yet cuts in the National Institutes of Health (NIH) budget are hindering the nation’s ability to rise to the challenge, top scientists said. “It’s unsustainable. The projections are that in a generation, maybe less, the annual cost of diabetes alone will be what the defense budget is today,” noted Daryl Granner, M.D., who led and expanded the Vanderbilt Diabetes Research and Training Center (DRTC) during much of the 1990s. “The problem with the government cutback is the incentives for people to stay in diabetes research — let alone to go into it, particularly clinicians — are just not there,” added prominent Vanderbilt researcher Alan Cherrington, Ph.D., a former president of the American Diabetes Association. Yet Vanderbilt continues to rise to the challenge, officials said, just as it did 40 years ago when Oscar Crofford, M.D., brought the nation’s first diabetes research center to the University, and a decade later, when he led a national trial that revolutionized treatment of the disease. 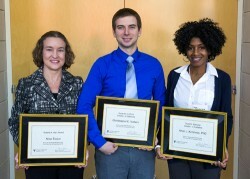 During last month’s event, two young Vanderbilt scientists, one a graduate student in Biomedical Engineering, the other a postdoctoral fellow in the Department of Molecular Physiology and Biophysics, were named the first “Scholars in Diabetes” in honor of Crofford and Granner. The graduate student, Christopher Nelson, who is developing a biodegradable “scaffold” to enhance diabetic wound healing under the mentorship of Craig Duvall, Ph.D., was named the Oscar B. Crofford Scholar in Diabetes at Vanderbilt. Arion Kennedy, Ph.D., who is studying immune cells and animal models of obesity and hyperlipidemia in the laboratory of Alyssa Hasty, Ph.D., was named the Daryl K. Granner Scholar in Diabetes at Vanderbilt. Alisa Escue, administrative officer of the Vanderbilt Diabetes Center, was awarded the Robert Hall Award for her service to the center. Alvin Powers, M.D., current director of the DRTC and Vanderbilt Diabetes Center, also announced the creation of lectureships in Crofford’s and Granner’s names. Crofford’s “impact at Vanderbilt is difficult to overstate,” Powers said. “He was the chair on the (national) commission in the 1970s that led to the creation of the NIH-supported network of diabetes centers. “That commission also laid the foundation for the Diabetes Control and Complications Trial, which changed the way physicians take care of diabetes,” he said. 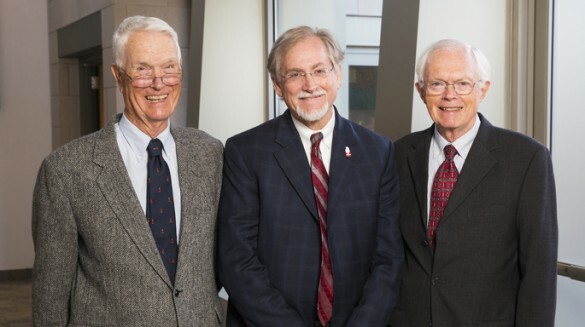 Similarly, Granner, who preceded Cherrington as chair of Molecular Physiology and Biophysics, recruited “a number of people who are the leaders in diabetes at Vanderbilt today,” and established and revamped training programs that are among the most outstanding in the country, Powers said. About 200 people attended Diabetes Day, which included lectures by four nationally known diabetes researchers and a poster session displaying more than 70 Vanderbilt research projects. The event was sponsored by the DRTC and the Vanderbilt Center for Diabetes and Translation Research (CDTR), both funded by the NIH. In addition to the DRTC and the CDTR, which is led by Tom Elasy, M.D., MPH, the Vanderbilt Diabetes Center includes the Vanderbilt Eskind Diabetes Clinic. Shubhada Jagasia, M.D., is the clinic’s medical director. Associate DRTC directors are Roger Cone, Ph.D., chair of Molecular Physiology and Biophysics, and Owen McGuiness, Ph.D., professor of Molecular Physiology and Biophysics. Others DTRC leaders include Maureen Gannon, Ph.D., who directs its enrichment, training and outreach programs and helped organize Diabetes Day; Richard O’Brien, Ph.D., who coordinates the center’s research base; and Roland Stein, Ph.D., director of the center’s pilot and feasibility program.